Hoodman is planning to release a new eyecup for Nikon Z cameras in the next 2-3 months. The new eyecup will be one of the round designs rather than the teardrop shape. This will let it be used in horizontal or vertical orientation. 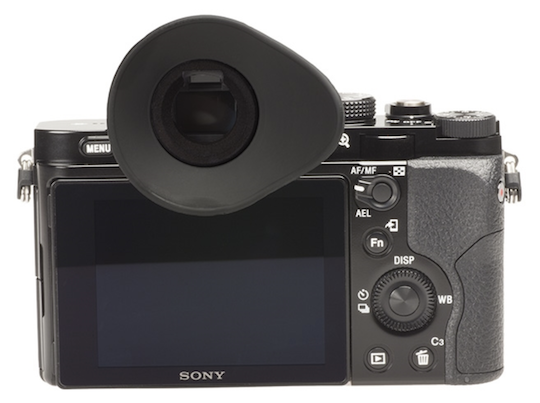 The eyecup will have a cutout for the eye sensor on the EVF - similar to the model they sell for the Sony mirrorless (pictured above). A reader who handled the prototype told me that the new eyecup will work nicely. It was created using a 3D printer. The bottom of the cup is flat so it won't block the LCD. It's expected to have a retail price of around $20. This entry was posted in Nikon Mirrorless Camera, Nikon Z6, Nikon Z7 and tagged Hoodman Hoodeye Eyecup for Nikon Z cameras, Nikon Z6 and Z7 accessories. Bookmark the permalink. Trackbacks are closed, but you can post a comment.